With so many news and studies coming out about how sitting all day is killing you and ruining your posture and raising your risk of heart disease, adjustable monitor/keyboard stands, standing desks, treadmill desks, and even bicycle desks have slowly worked its way into offices (or at least the ones that can afford them). Of course, given tight budgets and difficulties integrating them into traditional offices, it’ll probably take a while, if ever, until standing or adjustable desks become the standard. When I was 22 and just getting started at my first job, I realized that all the sitting I had been doing at college carried over to my work life – except it was worse because I wasn’t walking around from class to class – and I started feeling pain. At 22?!?! Something had to be done, so I created a makeshift standing deskat my first job, complete with empty boxes and an anti-fatigue mat. The only reason I was able to accomplish this without drawing too much attention was by getting lucky. 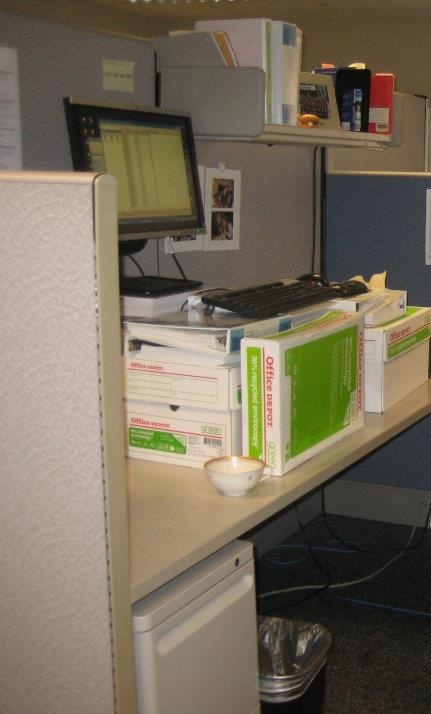 I was stationed at a corner of the cubicle farm which meant I had a high cubicle wall. This meant I could stand up without peeking over the edge and see someone else working. With this setup, there was a bit of an adjustment period – I tired myself out quickly, but over time, I grew used to it and actually had more energy! Alas, after switching jobs, I had no such luxury. If I stood up at my current desk, people in the hallway could see me working, and I’m pretty sure my neighbors wouldn’t appreciate watching me make silly faces at them while writing code. But I knew I didn’t want to be sitting for long periods of time without doing something – so here is a set of strategies you can implement into your workday if you have to sit in front of a computer screen all day like me. My strategy is to keep a trusty carafe at my desk filled with hot water. First thing every morning, I fill it up with almost-boiling water so I have plenty of cups of tea for the day. You can also accomplish the drink-all-day habit by always having tons of cold water at your desk. One way is to fill up a gallon of water at home, freeze it, and then bring it to work so they have an entire day’s supply of ice water at their desk. Drinking cold water does burn a few more calories than drinking warm water. The reason you will want to do this is so you force yourself to take trips to the bathroom at least once per hour. Now, this is not to say I have not tortured myself at meetings because I didn’t have time to stop by the bathroom, but in the end, you’re still forcing yourself to get up and walk. Plus, you’re also keeping yourself hydrated. Of course, try not to overdo it. I keep this trusty electric toothbrush at my desk. After breakfast/lunch and any snacks in between, I make it a habit to brush my teeth. Yeah, I get the occasional comment like “I should brush my teeth like you do” or “You must have really clean teeth” or “You make me feel like my teeth are always dirty,” but hey, fewer cavities, fewer dental procedures – and a great, healthy reason to just avoid sitting on a chair for a few minutes. If you’ve been following the SBR method for lunch, chances are, you also have dishes that need to be washed and used again the next day. After lunch, run to a bathroom with your dirty dishes and scrub those bad boys. Keep a sponge, detergent, and microfiber towel handy for easy cleaning. What better way to spend a few minutes moving around than by getting organized? I find that cleaning can be a somewhat therapeutic activity, and doing it once a day can help you get situated and work more efficiently. I will do a post about backbending some time later, but this yoga pose is what I mean. Stand up, Put your hands on your hips, tilt your head back and push your hips forward and try to slowly bend backward so that you can look behind yourself. If you have never done backbending before, this will probably be very uncomfortable for you. If you are feeling daring, extend your arms out. If you’re feeling really daring, clasp your hands together overhead while your arms are extended. Hold for a few seconds, then slowly and carefully come out. You may feel like your spine is getting compressed, but what you’re really doing is reversing bad posture and working your lower back muscles. If you have any other strategies that you use to make sure you keep yourself active at the office, leave them in the comments!